Miley Cyrus is hoping May will be easier on her health than April was. After having to postpone her "Bangerz" tour for a second time due to an allergic reaction, Cyrus tweeted over the weekend that the European leg of her trek is picking back up as planned. Miley Cyrus has twerked her way out of being associated with Disney, but the singer/actress has no ill will for her former employer. In actuality, the former "Hannah Montana" star, who built her fame with Disney's once-popular show, has gratitude for the House of Mouse. Miley Cyrus' "Bangerz" tour recently hit a scary bump in the road. On Monday, Cyrus' younger sister, Noah, chronicled a fire that ravaged one of the tour's buses. When Katy Perry's a fan, she has no problem showing it. The 29-year-old pop star was just one of the celebrities in the audience at Miley Cyrus' "Bangerz" concert in Los Angeles on Saturday, but she was the only one who got to kiss Cyrus and then tell about it. 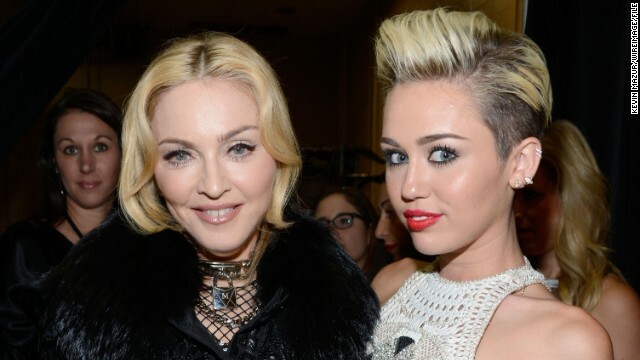 Miley Cyrus: The new Madonna? We thought Miley Cyrus' MTV VMAs drama felt familiar. The 21-year-old singer has recruited Madonna for her "MTV Unplugged" special, and the star admits that she takes some inspirational cues from Madonna.